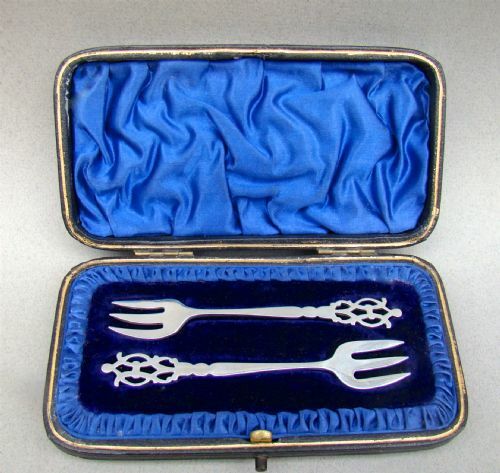 These silver appetiser forks or caviar forks have a very elegant design. They were made in Birmingham 1912 by the prolific Adie & Lovekin. The three pronged forks with pierced decorations and unusual scalloped design. Mounted with tapered mother of pearl handles. Fitted in their original Morocco leather presentation box. The interior of the box lined with satin and velvet. Length: 13.5cm / 5.2 inches. 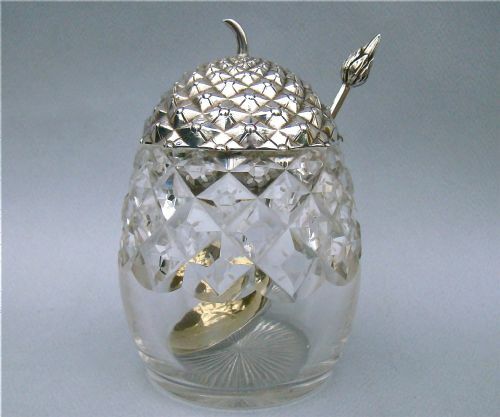 This is a stunning and unusual Victorian silver novelty preserve jar in the form of a pineapple. The textured silver lid with stalk finial and slot for spoon. The matching spoon with gilt bowl and leaf finial. The heavy glass body partially incised with diamonds resembling a pineapple body. Registration/patter number impressed on inner lid. HW&Co for Henry Wilkinson & Co. Date letter "O" for 1857. Silver lid and spoon in perfect condition. This delightful and rather rare sterling silver honey pot or preserve jar was made in the turn of the Century. The tapered body applied with solid silver lattice and garlands of flowers interspersed by fleur-de-lys patterns .The lid with elegant concentric decorations and silver mounted finial. Comes with a Victorian solid silver preserve spoon made by A & J Zimmerman and dated Birmingham 1898. Base diameter: 8cm / 3.2 inches. No loss to the silver. This exquisite pair of silver gilt preserve spoons was made in Bergen, Norway by the collectable silversmith Marius Hammer. 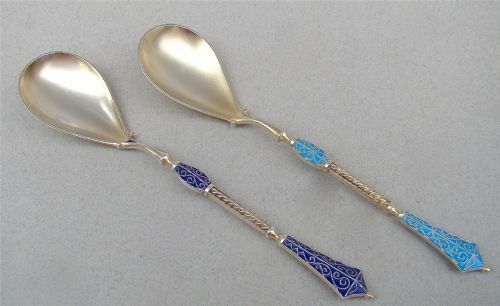 Each cast silver gilt spoon with intricate turquoise, blue and white enamel decorations. The work is reminiscent of Russian cloisonné enamel silver of the period and the Norwegian version takes inspiration from a Viking style called "Dragestil". Bowl : 4cm x 3cm / 1.4 x 1.2 inches. 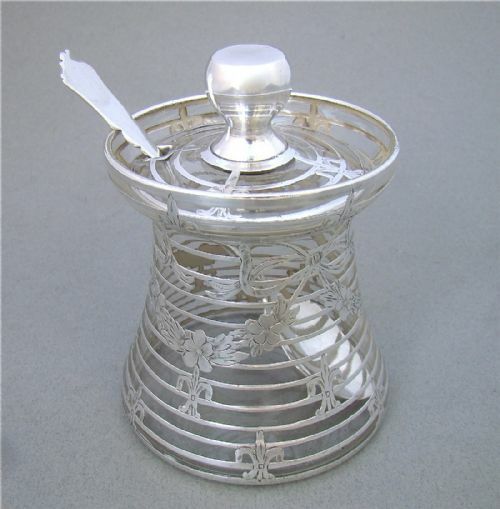 This is a stunning and unusual Edwardian silver lidded large preserve jar. The plain, slightly domed silver lid resting on a panelled glass cylindrical body. 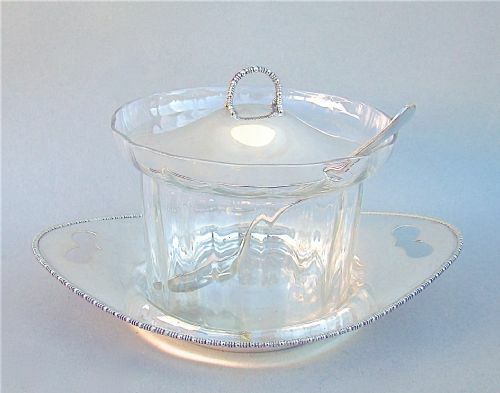 The glass fitted on an elegant navette-shaped tray pierced either side with hearts. Both lid finial and tray with a distinctive ovolo border. The lid with a slot for the spoon. The solid silver spoon , dated Sheffield 1920. Date letter "o" for 1906. CB & S for Cooper Brothers & Sons Ltd. Date letter "c" for 1920. This exquisite silver lidded preserve jar is dated Birmingham 1914 and was made by the illustrious George Unite. The spherical glass body wheel-engraved with delicate flower and laurel leaf garlands. The domed silver lid with a matching laurel leaf garland. It is sold with its original, matching solid silver preserve spoon , which is a rare occurrence. Diameter: 10.5cm / 4.3 inches. 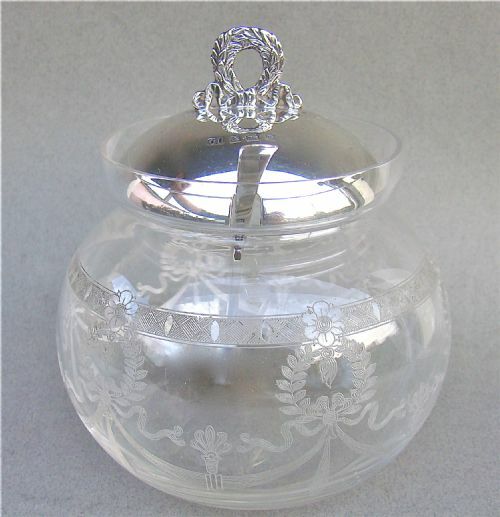 This is a rather fun Victorian silver and clear glass preserve jar in the form of an apple. 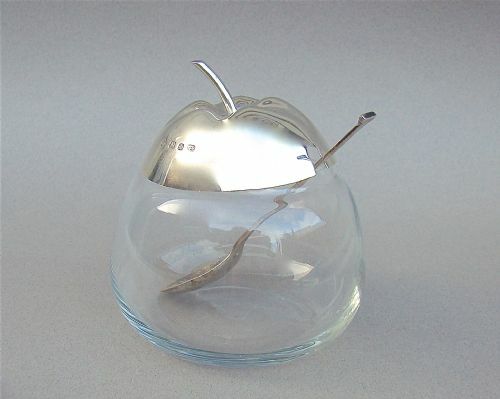 The glass body with a solid silver lid realistically shaped as the top of an apple and having a stalk as a finial. Sold with a seal top silver preserve spoon made by William Haseler and dated Birmingham 1902. N&W for Norton & White. Date letter "m" for 1912. Spoon in very good condition. This exquisite silver lidded preserve jar is dated Birmingham 1922 and was made by the illustrious George Unite. The baluster glass body raised on a pedestal foot and wheel-engraved with a laurel leaf garland within a beaded border. The domed silver lid with baluster finial. Sold with a solid silver preserve spoon made by Mappin & Webb and dated Birmingham 1928. This delightful silver plated and cranberry glass preserve jar dates circa 1890. The slightly tapered body with unusual white piping decorations. The domed silver lid with an elegant ring finial. It is sold with a matching silver plated preserve spoon. Base diameter: 9cm / 3.4 inches. This elegant silver lidded preserve jar was made by the reputed Hukin & Heath and is hallmarked for Birmingham 1930. 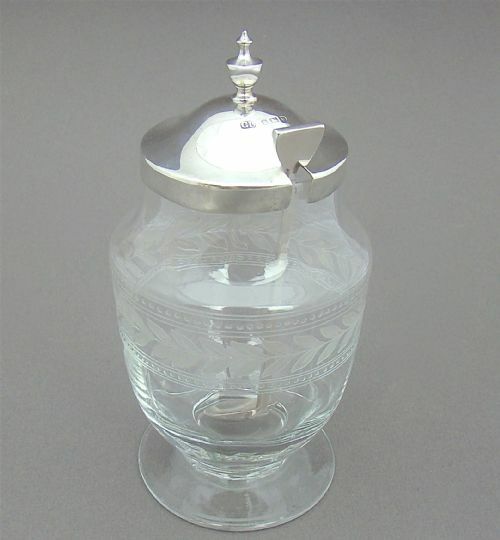 The plain, slightly domed silver lid resting on a sliced-cut glass glass baluster body. 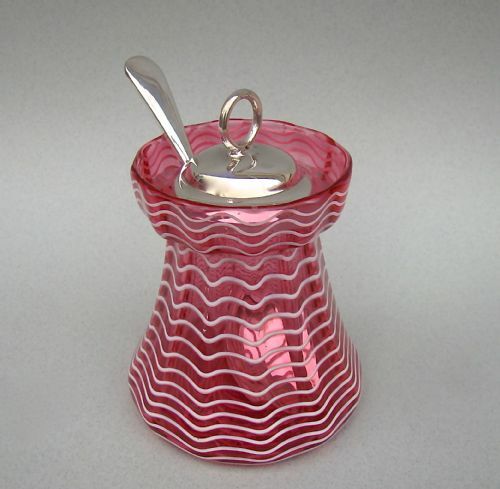 The lid with a distinctive reeded loop handle and a slot for the spoon. Sold with an eklelgant Art Deco wirework silver spoon dated Birmingham 1922. H&H for Hukin & Heath. Date letter "v" for 1922. Diameter: 8.5cm / 3.2 inches. Silver lid with minor surface wear, commensurate with age. This elegant silver plated articulated preserve jar bears the marks of the reputed Hukin & Heath* and was made circa 1900. 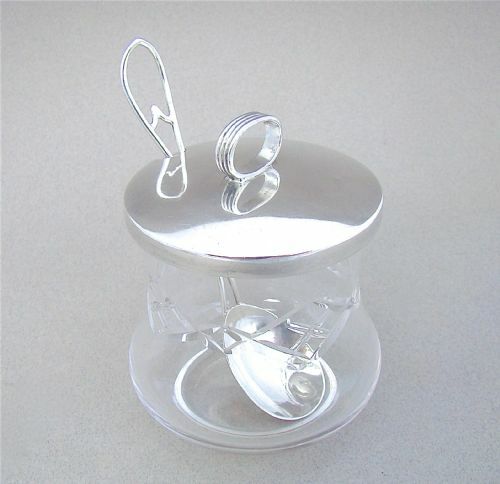 The clear glass cylindrical body mounted with a mechanical silver plated lid. 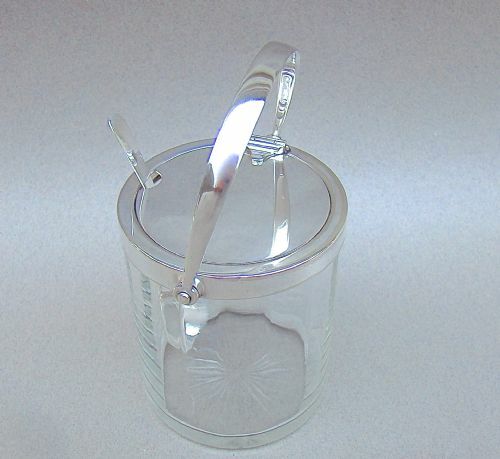 The lid and swing handle allow for the jar to be opened using only one hand. This clever mechanism was created by Hukin & Heath in 1898, granted Patent No. 5518 and produced between 1898 and 1904. It comes with a matching preserve spoon also bearing the marks of Hukin & Heath and dated Birmingham 1900. Electroplated marks H&H for Hukin & Heath. The mechanism is in very good working order. 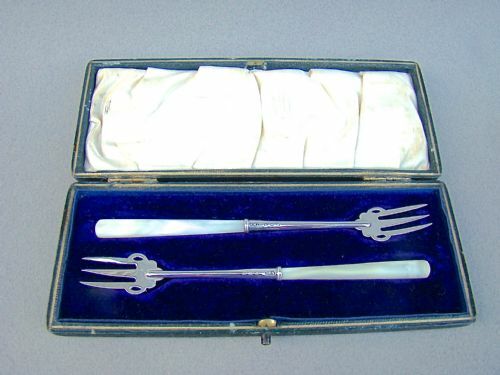 These Edwardian silver pickle forks have a very elegant design. They were made in London 1905 by James Wakely & Frank Clarke Wheeler. Each stem with pierced scrollwork terminals. Fitted in their original Morocco leather presentation box. The interior of the box lined with satin and velvet. J.W over F.C.W for James Wakely & Frank Clarke Wheeler.